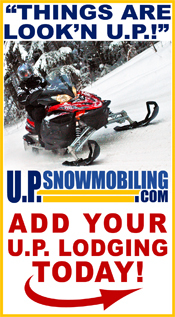 www.UPSnowmobiling.com is your Upper Michigan Snowmobiling Headquarters for winter recreation. Our website offers up-to-date important snowmobiling information, snowmobile trail reports, gear, and links. Michigan snowmobiling has grown substantially with over 3,000 miles of groomed trails throughout the state. Every year Upper Michigan is ranked as one of the United State's best places to snowmobile by various groups and magazines. When planning your Upper Michigan snowmobile vacation, make your arrangements with our Upper Michigan Snowmobiling website. We are dedicated to you, the preservation of the sport, hospitality, honest reporting, Michigan tourism and the well being of area businesses. We offer important snowmobiling information when you need it most. We work directly with local U.P. residents for snowmobile trail information. Upper Michigan Snowmobile Trail Reporters, Snowmobiling Forum, Snowmobiling Lodging, Weather, Snowmobile Rentals, Interactive Snowmobile Calendar, Snowmobile Stories and Photos, Snowmobile Club Links, and Winter Web Cams, will help ensure that your snowmobile vacation is memorable. 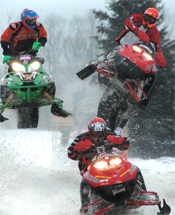 Michigan Snow X Racing Association holds annual racing events throughout the Upper Peninsula. Don't miss out on the huge selection of snowmobile jackets, snowmobile gear, pants, videos, books, and accessories now available through our website. You can search for a multitude of items through the site. Visit our snowmobile lodging pages by county or city to view a variety of Upper Michigan hotels, motels and cabins. UP Snowmobiling also offers a number of properties in which you can book directly online. Click here to view our Upper Michigan Snowmobile Trail Reports by city. From the Western Michigan's Porcupine Mountains to the Eastern Upper Peninsula's Drummond Island, we’ve got you covered! 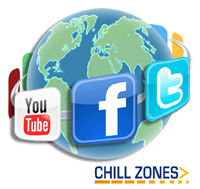 Visit our "Chill" Zones page for facebook, youtube, and other social networking accounts. These areas will provide viewers with additional info and media from people throughout the country. We will be uploading great snowmobile videos in the near future. Our snowmobile trail maps are free, up-to-date and provided by the Michigan DNR. Our store also offers a Michigan Snowmobile Trail Guide book available on the maps page. U.P. 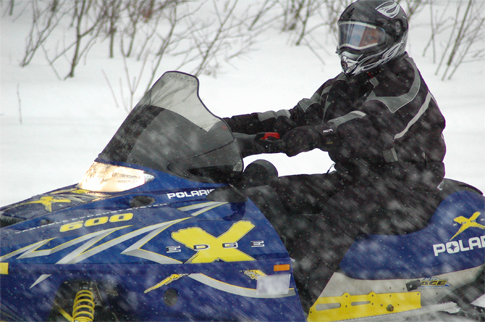 Snowmobiling is a privately owned business located in the heart of Michigan's Upper Peninsula. We are dedicated to you as our guest and your experience while vacationing here in Michigan's Upper Peninsula. We strive to provide you with a variety of vacation options to suit your needs. We launched our first version of www.upsnowmobiling.com in January of 2004. Since then, we have been dedicated to the sport of snowmobiling and providing vacation options to browsers. We promote honest snowmobile trail reporting, a healthy Michigan tourism and the well being of area businesses. Your vacation's success depends heavily on a prosperous economic environment with a variety of choices in shopping, restaurants, & lodging. To learn more about our company, please visit the About Us page. We thank you for visiting and look forward to seeing you on the trails! Snowmobiling the Upper Peninsula of Michigan is the most exciting sport there is in the the Great Lakes Region. We invite you to explore our ever growing Snowmobile website for great information. Great fun for families and groups. This opportunity is perfect for the family or for groups that are searching for an exciting Michigan vacation. Please remember to ride responsibly. We want everyone to stay on the trails, don't drink and drive, and watch out for your fellow snowmobilers!